Remember the days when business trips meant getting used to travel-sized toiletries, fold-out ironing board, and frantically juggling phone messages from the office? Thanks to VoIP technology, traveling no longer means losing touch. With mobile VoIP, you can receive client calls regularly and collaborate with your colleagues from wherever — whether you’re in your firm’s brick and mortar building, at the airport, or checking into your hotel room. Still not convinced? Here’s a closer look at how VoIP is helping traveling professionals win over customers and stay productive when they’re not in their usual environment. Mobile VoIP pairs your mobile device with VoIP technology through an app. As long as there’s a solid mobile phone signal (at least 3G) or Wi-Fi connection, you can have seamless integration between your mobile devices and work lines. When someone calls your office while you’re away, the call will be forwarded to your mobile phone. That gives you the ability to receive calls wherever you are in the world without your customers knowing that you’re away from your office. With all of these features, you can be certain that you’ll always be able to stay in touch with clients and colleagues wherever you are — even if you’re traveling abroad. And mobile VoIP makes sense financially, with Ooma Office costing only $19.95 per month per user. Overall, after three years, the average customer saves about $6,185.44 just by switching from a traditional landline to Ooma Office, a leading VoIP provider. It’s not uncommon for business VoIP providers to offer unlimited nationwide calling. Ooma Office, for example, provides unlimited calling in the U.S. and Canada. This means that you don’t have to be concerned about accumulating roaming voice charges or going over your minutes while traveling throughout the country. With the mobile app, you now have a remote office in your pocket for a cheap and flat monthly rate. What if you have international clients or have to stay in touch when abroad? Well, with a VoIP account, mobile app and Internet connection, it’s never been cheaper to make international calls. In fact, a majority of business VoIP providers offer unlimited international calling plans — Ooma has international calling plans starting at just $9.99/month. This is ideal for traveling professionals who make frequent trips overseas or who have clients across the world because it eliminates those pricey international calling rates. As an added perk, you’re only charged for data — not roaming call fees — when making and receiving calls through the mobile app, which uses Wi-Fi. Virtual faxing is simply transmitting faxes over the Internet. This means that you can send faxes from almost any Internet-enabled device, like a smartphone, laptop, or even traditional fax machine. With virtual faxing you can send and receive faxes via email as attached PDF or TIFF files. This is an essential feature when there are documents — like proposals or contracts — that your clients have to sign in person. Ooma Office provides virtual faxing through a convenient web portal. There’s no doubt that business trips are useful; after all, nothing beats face-to-face interaction. But they can get expensive over time — especially when you just need to follow up with a client. Audio conferencing is often a viable and much less time-consuming alternative. This is yet another perk of VoIP. You can schedule a conference call by using a virtual conference room. Just invite attendees to call the extension number and PIN for the conference room that you’ve set up. Audio conferencing not only reduces the need for travel, but it’s also a reliable and trusted way to build relationships with your clients because you can conveniently and cheaply stay in touch. As a traveling professional, you can use VoIP technology to win over your customers whether you’re in the office or out on the road. Best of all? 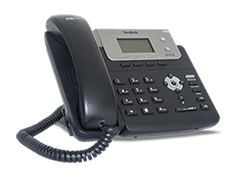 VoIP replaces those pricey landline and cell phone bills you’ve been paying. 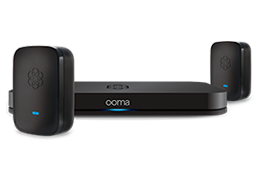 If you’re ready to start tapping into the power of VoIP, give Ooma a call today at 877-621-0515.